Instant decaf coffee has been snubbed by coffee “experts” for years, but that doesn’t mean that it doesn’t have its place in our lives. Although you’ll never get the same rich, deep flavor that you’d get from grinding your own beans and making coffee from scratch, you can still end up with a pretty nice of coffee using one of these products. Of course, if a great cup of coffee is your goal, then you are going to want to buy the best decaffeinated instant coffee that you can find. That’s why we’ve gone ahead and done the research of finding the best instant coffee products available and have listed them below for convenience. Now anyone can make a cup of great coffee anytime and anywhere. Nescafe Taster’s Choice House Blend is a lightly roasted instant decaf coffee that’s manufactured using coffee beans that are not only 100% pure but are also sourced from responsible sources. This coffee is then roasted by master coffee roasters and then flash freeze-dried to lock in its balanced and complex flavors. All of this makes coffee a great choice for anyone looking for a great coffee, although it does seem to lack the same flavor punch that dark roasted coffees tend to have. Sanka is a quality coffee that comes in single-serve envelopes which are easy to store and even better, easy to use. These packets contain a decaf instant coffee that’s been thrilling coffee fans for years. Although its flavor isn’t extremely complex, one of its appeals is that it is a simple coffee for coffee fans who love just a plain cup of coffee. However, it is rich in flavor and is made from some of the best coffee beans gathered from all over the world. Most people have some experience with Starbucks and know that they make some really good coffee. However, these people may not realize that this company also produces some very good decaffeinated instant coffee. Evidently, they’ve been able to transfer their coffee making skills to these easy-to-use instant packs so anyone can enjoy an Italian roast coffee at home. Although these packets do tend to cost more than just about every other instant currently available, it is a very nice tasting coffee that’s made from 100% Arabica beans. This coffee is not only made with organic coffee, but it’s also made with Lion’s Mane and Chaga mushrooms. Why do they add mushrooms to their instant coffee? That’s because mushrooms are not only nutritionally dense but are also supposed to have a positive effect on mental concentration and are also supposed to be a good source of antioxidants. Although this product isn’t entirely decaffeinated, it does have half the caffeine of most coffees. And it’s also Vegan, Paleo, and dairy-free, so it can be enjoyed by just about everyone. These single-serve packets of instant coffee have an authentic Latin flavor that many people are going to love. Although it’s not as strong as other coffee blends, it does have a nuanced and smooth flavor that some people take an instant liking to when they first drink it. Its packets are easy to store and can be quickly pressed into service when a cup of steaming coffee is desired. It’s a cup of coffee that’s delicious in the morning but also makes for a delicious after-dinner coffee. Mountain Hagen uses coffee that’s made from Arabica beans and is roasted carefully to preserve their flavors. It’s then freeze-dried to preserve its integrity and is placed into a container that holds approximately 60-servings of coffee. What’s really great about this coffee is that it’s sourced using Fair Trade coffee beans that have been grown without the use of artificial fertilizers, pesticides, herbicides or fungicides. Although this means that this product costs more than other coffees, but it also means that it’s completely organic and tastes good, too. Anyone seriously considering switching to a decaffeinated freeze-dried coffee may want to take a closer look at this one. It’s a medium roast coffee that’s not as mild as light roast blends but isn’t as intense as dark roast ones. It’s a mellow and well-balanced coffee that is not only a good way to start the day but is also good after dinner coffee. Although it’s more expensive than its nearest competitor, it does deliver quite a unique taste that’s sure to put a smile on many coffee lover’s faces. The first thing we noticed about this coffee was its jar. Although it does have a lightweight plastic jar with a lid that’s easy to open, it’s jar design wasn’t optimal in our opinion. This means that it wasn’t as easy to get the coffee out of it as we would’ve liked. Having said that, however, once we did get the coffee out of the jar, we realized it was a tasty blend that could be enjoyed any time of the day. It’s smooth, tasty and is never bitter. Whether it’s used to make coffee or used to for baking purposes, it’s sure to please a lot of people. Although the jar could’ve been better designed and it isn’t easy to dispense coffee out of it when getting down to the bottom of it, that’s really the only bad thing we can say about this brand. It’s easy to serve up and makes a coffee that’s extremely smooth, mellow and delicious. Every cup we brewed turned out to be completely balanced, and it was never bitter. And each jar is capable of making up to 120 6-ounce cups of coffee, so now there’s never any reason not to have a cup of decaf coffee ready and waiting for guests. This resealable container of Maxwell House International Coffee contains an instant decaf coffee that is not only free of the caffeine found in regular instant coffees but is also sugar-free. What it doesn’t skimp on, however, is a great taste. Easy to make with just a little bit of hot water, this coffee gives the user the bright notes of French vanilla that will make them feel like they’re in a cafe drinking coffee. Although it does contain dairy, this product will satisfy the palettes of most people and is a great brand to serve with dessert. Instant coffee has been around since the late 19th century and decaffeinated coffee has been around since the early 20th century, so it’s no surprise that quite a few enjoy a cup of instant decaf coffee. However, let’s be completely honest. Most people drink this product because of convenience and not because it’s the greatest coffee product available, especially when it’s made according to label directions. However, that’s not to say that this coffee can’t be great. By paying a little bit of attention to how the coffee is made, anyone can create a high-quality coffee that tastes really great, and it doesn’t add that much time to the process of making a cup of coffee. In fact, to show you just how easy it is to make a great cup of decaffeinated instant coffee, we’re going to give you the step by steps to a better coffee. The first step towards better instant coffee is choosing a high-quality product. You can find better instant coffee by finding coffee that’s freeze-dried instead of spray-dried coffee. Also, look for name brand instant coffees as these tend to produce the best results. Of course, if you don’t want to put in all of that work to find a great instant product, then you can always check out our top ten list above and pick any one of those on the list. The next step towards better coffee is using better water, and this usually means filtering the water that comes out of your tap. Before you start sighing, however, and complaining that it’s going to add time to your coffee making procedure, let us tell you that using filtered water doesn’t have to overcomplicate things. If you buy a water filter pitcher, you can have a pitcher full of clean water whenever you need it. Or if you don’t like that idea, you can always add a filter to your tap. Any of those methods will make be fine for our coffee making procedure. Heating the water for the coffee is the next step to consider. Be sure to use a tea kettle or a quality aluminum pot for boiling water. If you don’t water to boil enough water for a whole pot, then microwave your coffee cup of water in the microwave. However, if you do it that way, then be sure to do it safely. Never microwave the water longer than necessary to get it hot and be sure to microwave it with a wooden pair of chopsticks in it. This will give the water points upon which to boil, and this will prevent explosive water even that can happen with microwaving plain water. Measure the amount of coffee into your cup that’s recommended by your coffee manufacturer. This is usually 1-teaspoon of coffee per 6 to 8-ounces of water, but you can feel free to adjust it according to your personal preferences. Before you pour in all of your hot water, you may want to pour in just a few tablespoons of water. Once you pour in this small amount of water, use a chopstick or a spoon to thoroughly moisten the coffee. This will not only ensure that the coffee is better blended, but it kind of allows the flavors in the coffee granules to blossom. Wait for 5 to 10-seconds, then proceed to step six. Now you can feel free to fill up the coffee cup with the rest of your hot water. Once you have filled it, it’s now ready to be consumed. However, if you want to add a little bit of extra flavor to your morning cup of Joe, then move on to the next section—which is aptly entitled Adding Extra Flavor To Instant Decaffeinated Coffee. Now, it’s time to decide whether you need to give the flavor of your instant coffee a little bit of boost. One of the first things that people should consider adding to their instant decaf coffee is cream and sugar. 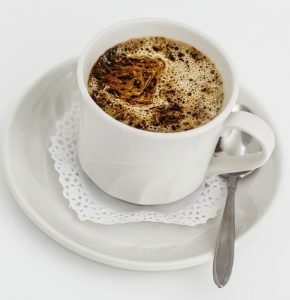 Sure, you may take your coffee black normally, but adding a little bit of cream and/or sugar can usually improve the flavor of instant coffee—even for those coffee drinkers who prefer black coffee. If you’re not fond of that idea, then you can add one of the following flavor enhancers.